Southwest Soul Circuit (SWSC) keeps it’s new year of concerts going with the 2018 Spring Concert. This show is scheduled for April 20, 2018 at Pima Community College Center for the Arts starting at 7PM. This year, SWSC is bringing back Theresa Tha S.O.N.G.B.I.R.D. 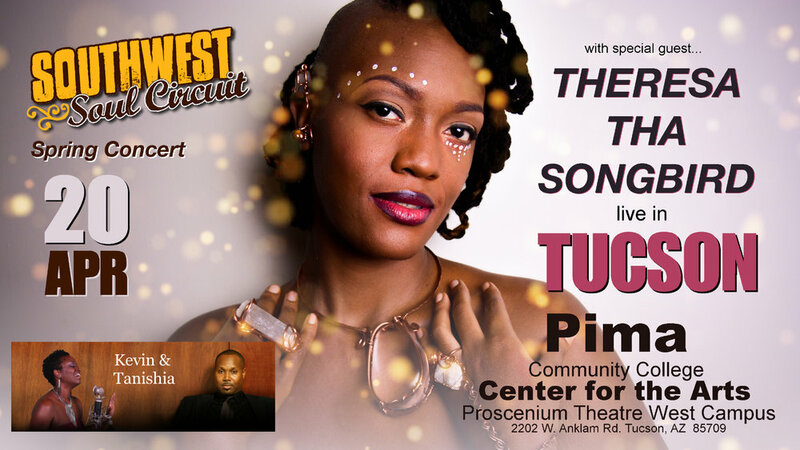 as the featured artist along with Kevin & Tanishia Hamilton. This 90 minute show will also feature Desert Soul Street Band and performances from experienced singers and musicians of Studio-Kevin Hamilton, a private music school based in Tucson, Arizona. This is a ticketed event, with sponsorship provided by MEB Management Services and Ken’s Hardwood BBQ. There will be artwork available in the lobby by Jared Clark, with 15% of the proceeds going towards funding for local youth to participate in Garden Youth Development Project programming.